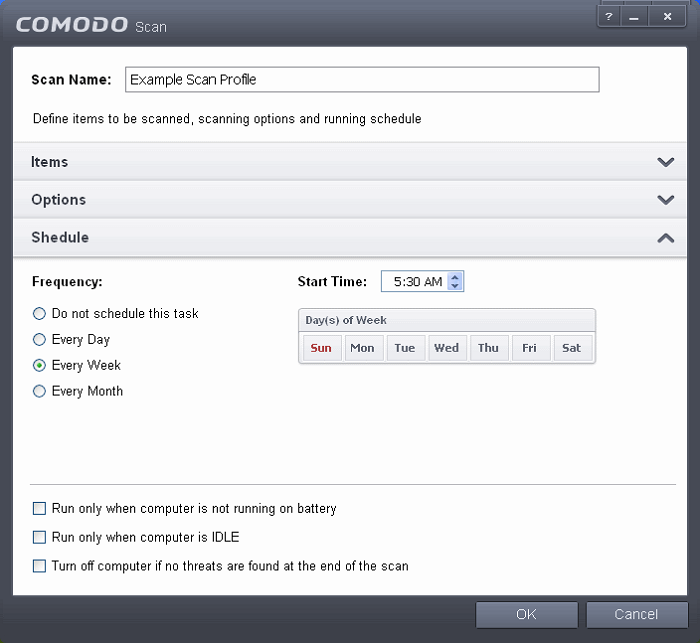 Comodo Internet Security allows you to schedule Antivirus scans on your entire system or on specific areas according to your preferences. 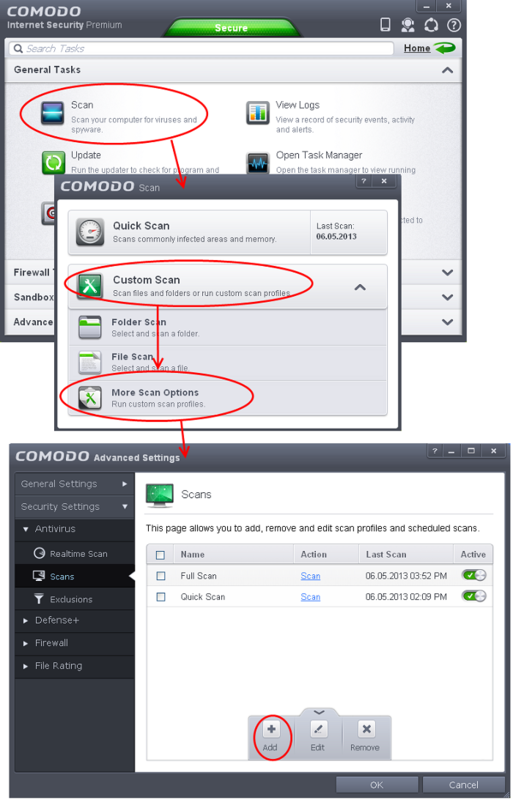 You can create a custom scan profile defining exactly which files and folders are to be scanned, when they are to be scanned and how they are to be scanned. Repeat the process to add more items to the profile. Click 'OK' to confirm your choice. Automatically clean threats - Enables you to select the action to be taken against the detected threats and infected files automatically from disinfecting Threats and moving the threats to quarantine. Limit maximum file size to - Select this option if you want to impose size restrictions on files being scanned. Files of size larger than that specified here, are not scanned, if this option is selected (Default = 40 MB). 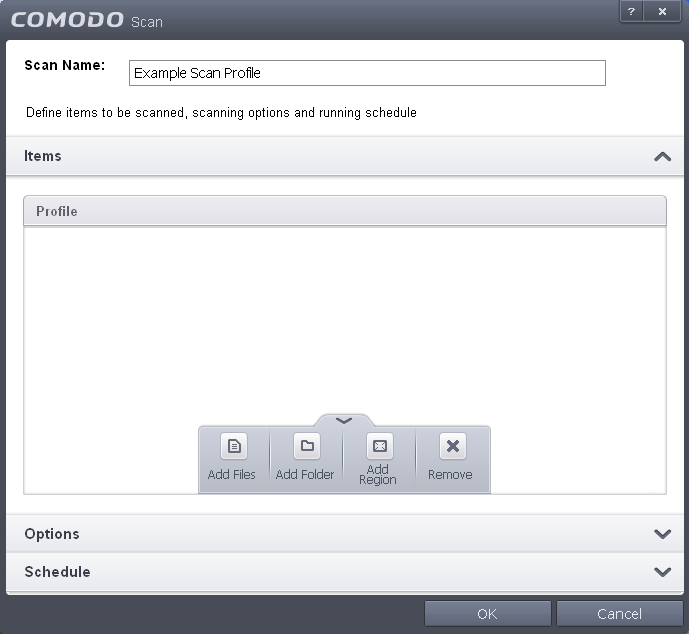 Run this scan with - Enables you to set the priority of the scan profile. You can select the priority from the drop-down. (Default = Disabled). 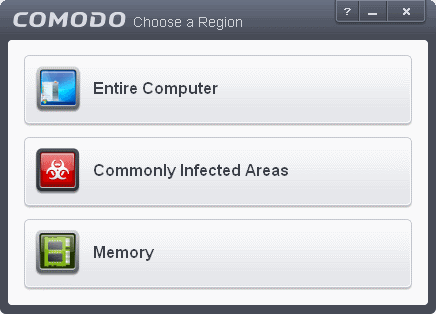 Update virus database before running - Instructs Comodo Internet Security to check for latest virus signature database updates from Comodo website and download the updates automatically before starting the scanning (Default = Enabled) . 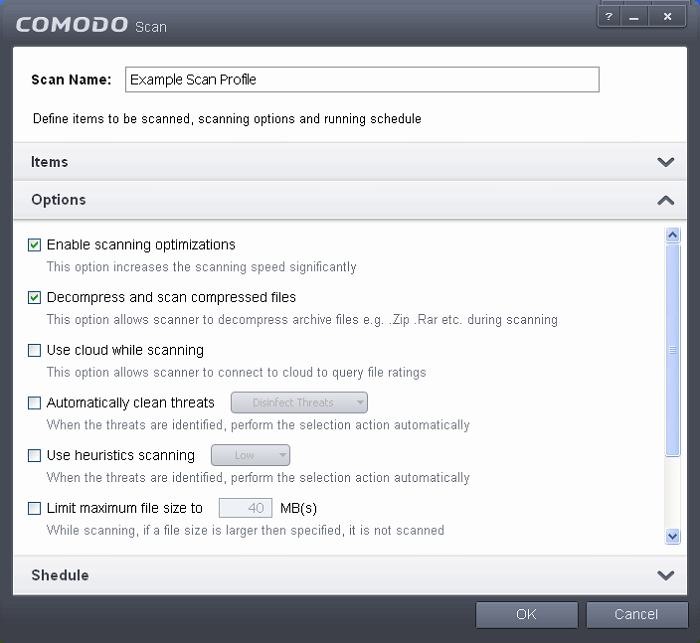 Do not schedule this task - The scan profile will be created but will not be run automatically. The profile will be available for manual on-demand scanning. Every Day - The Antivurus starts scanning the areas defined in the scan profile every day at the time specified in the Start Time field. Every Week - The Antivurus starts scans the areas defined in the scan profile on the day(s) of the week specified in 'Days of the Week' field and the time specified in the 'Start Time' field. You can select the days of the week by directly clicking on them. Every Month - The Antivurus starts scans the areas defined in the scan profile on the day(s) of the month specified in 'Days of the month' field and the time specified in the 'Start Time' field. You can select the days of the month by directly clicking on them. The profile will be saved and the selected areas will be scanned repeatedly as per the set schedule.